Discretionary power is the greatest systemic evil we face, and understanding this will allow us to create fairer societies that minimize discretionary power. Minimizing discretionary power is as simple as considering its effects in policies. Discretionary authority is the power to interpret rules with whatever thoughtless indifference, bias, prejudice, or preference that might maximize your or your friends' benefit. Judges, Prosecutors and Police/Regulators have the most pronounced discretionary authority and can affect peoples lives by their choices. The 2 primary abuses are persecuting the innocent, and choosing to interpret rules and facts to favour the powerful. Kings and other rulers have the ultimate discretionary authority. They don't have a pretense of rules that apply to them, and their discretion includes budgetary authority. The primary abusive power though is the discretion to persecute, murder and destroy, and perpetuate policies of systemic misery. Freedom is freedom from the discretionary authority that others have over you. Money can buy both freedom and discretionary influence over others. God, if he exists, is first and foremost a humanist. I prefer to wish that he believes more in the prosperity, growth, and happiness of humanity, than in whether groups choose to eat bacon wrapped shelfish after sunset on Fridays. God exists independently of any mythology or church. I prefer to insist that God believes in truth over worship. There is no statistical relationship between prayer and earthly rewards. If God believes in truth then prayer would be ineffective as your rewards or lack thereof are what you deserve regardless of what you ask for. The relationship to discretionary authority is that nearly all of us understand God to be an all powerful king, and prayer as a telepathic audience before your benevolent ruler to grant you wishes. If you understand God that way, then it validates the similar power of your king and the hierarchy below him as well. After they come for the others, they will hopefully stop there. The contentment of having classes below you. The understanding that you are worthless maggots that deserve to be controlled by rulers and their hierarchy since that is as it has always been. The article I linked (most of us support slavery) is worth reading. While we fully support abolition, we continue to support the closest possible equivalent to slavery. He is first and foremost a dictator with a will to be enforced. Secondarily that will may support truth, justice and humanity. There is first and foremost truth, justice and humanism, and loyalty to God is first and foremost loyalty to truth justice and humanity. The significant implication of the first model is that your loyalty to God and his earthly hierarchies is a loyalty to "us" vs "them", which is incompatible with truth, justice and humanism, and so promotes systemic oppression and conflict. Basic income is an equal social dividend paid to citizens unconditionally that is sufficiently large to eliminate poverty and eliminate most discretionary authority social services. The funding formula is a simple combination of income tax increases, program cuts, and (optionally) money printing. No one who has ever faced an income tax bill is oppressed. They've earned money higher than the tax bill, and so have any freedom they wish to buy. The philosophical objection to taxation is entirely rooted in the concentration of discretionary authority accumulated to the king. Basic income channels taxation to the entire population, and so eliminates this discretionary power accumulation. Because basic income guarantees everyone's survival needs, survivalist desperation is no longer a motive for employment or crime or any other behaviour. By definition, this eliminates systemic oppression within a society. The survivalist desperation motive for work is equivalent to slavery in that it forces you/them to choose a master without the equal bargaining power of fair transactions. Denmark has higher wealth innequality than the US. If we accept the simplification that it is a high taxed utopian redistributive society, then the only explanation is that the rich get richer because the poor and middle classes have little reason to save, and thus trade all of their money for goods and services to those who have more money than they know what to do with. Jobs still get done in Denmark, and the rich are still able to buy discretionary influence over minions, they just have to pay a little more than under a slavery system, and still the money they pay helpers flows back to them anyway. Wealth innequality is not a problem. Poverty and misery is. Higher taxes does not prevent the rich becoming richers, but through basic income/social dividends gives everyone else the freedom to enjoy and pursue a happy life. The idea that we need to control everyone else to have a productive economy is as stupid as the proposition that everyone else should control you. Your security is enhanced by non-oppression as there is less reason to make threats against you. Prison is the ultimate discretionary authority power that can negatively impact your freedom. Maximizing systemic oppression to funel as many people into prison as possible maximizes the discretionary authority benefits to police, courts, institutions, and kings, and promotes fear of the king, and in turn the king creates fear of the future prisoners into his loyalists. Basic income both reduces the desperation motive for crime, and so lower the core basis for fear, It can both disarm the king's power to use that fear to accumulate more discretionary power, and lower the budgets of the institutions that exist to institutionalize the scary, and provide savings to social dividend recipients and tax payers, while reducing the abuse of power through a reduced institutionalization sector. Promoting the legitimacy of "our" violence while making "their" violence illegitimate is an eagerly acceptable proposition. In addition to this extensive list of confirmed false flag terrorist actions (which includes the believable statement that more terrorist attacks are false flag than not), there is the nearly as important issues of discretionary authority to shape the narrative of violence as acts of terrorism, and the active infiltration of groups by agents in order to create terrorism plot arrests if the targets and hapless, slow and reluctant, or, at discretion, terrorism. All of these acts promote the fear necessary to enhance discretionary authority to protect you from such fears. Terrorism is a political recourse to violence caused by a lack of democratic political recourse. Choosing suicide bombing is an act of protest that your government will easily manipulate you into acting as its human shield, rather than consider discretionary policy revisions. Basic income and the elimination of as much discretionary disappointment that can be felt, will influence more constructive choices than suicide and self-destructive vengence, and if not, perhaps a clearer framework to assess "our" evil, or who is most responsible for your expendibility. The military recruitment base fundamentally depends on systemic desperation. Reducing war can be accomplished by increasing the cost of soldiers, and the freedom to refuse committing atrocities. The 2nd amendment of the US constitution is one that explicitly allows and promotes insurgency as a remedy for abuse of discretionary authority. It was foresight, that did not presume the approval of insurgency by future kings. The discretionary authority to shape allowable opinions shapes the continued discretionary authority of the ruling class by limiting democratic options. Beyond the false blaming of groups not allowed an opinion with terrorism, widespread discretionary spying allows discrediting those opinions that are not allowed. Retaliations against whistleblowers of discretionary abuse is the most glaring corruption of democracy. The main source of discretionary authority among lower hierarchy levels are laws. Selectively applying or selectively ignoring the proper interpretation of rules. Basic income can eliminate minimum wage regulations, and much labour regulations. The freedom to refuse work should ensure fair conditions. Drug and prostitution laws are very expensive, create violent conflicts over their markets, prey on the systemically oppressed to participate in such dangerous markets, and enable discretionary power to enable these markets and participate in their profits. If the worst possible outcome of basic income is that more people choose chronic drug use, then they will at least do so with no negative effect to the rest of society. The reduction of violence and institutionalization of society is both a significant expense reduction, and a tremendous source of hope and opportunity for those that would be affected. Regulatory capture is a valid right wing criticism of the ease of coopting the regulatory agencies charged with overseeing the powerful, to instead serve those they are supposed to oversee. Today, in every western state, the environmental, securities, and judicial overseers exist more to tell us that everything is always ok instead of actively searching for abuses. Their jobs depend on serving the hierarchy. Selective actions against outsider non-sponsors of the ruling class are enacted to maintain an appearance of activity and to strengthen the hierarchy's will. Assuming that we want a clean environment, and fair securities and judicial systems, then we need regulators directly accountable to the electorate, and thus not hierarchically subservient. Independent, narrowly focused directly electorate accountable overseers necessarily provides the best oversight as there is no one else to deflect blame to. This model also generally applies to creating laws and oversight that limit the discretionary abuse of the powerful, where those limits are needed. Another definition of freedom is the freedom to do something without asking permission. Creating your own energy (solar/wind) allows you to escape from the discretionary pricing power of centralized utilities. Publishing your own video and other content is possible through the internet compared to models that require you to seek permission and support from publishers. The sharing economy for transportation and lodging similarly enables trade without permission access to employment. There are forces that want you to keep begging for permission. Doing so only for the protection of their hierarchies is a fundamental assault on your freedom. Hexayurts are an incredibly simple, and affordable design to make a self supported fully enclosed building using common materials with a few simple cuts, and no material waste. If made out of plywood, they are animal proof, and if made out of insulation foam board, they are light and foldable. A Hexayurt has 6 sides, and with light materials, can be held together with tape. The link above shows how easy they are to make. 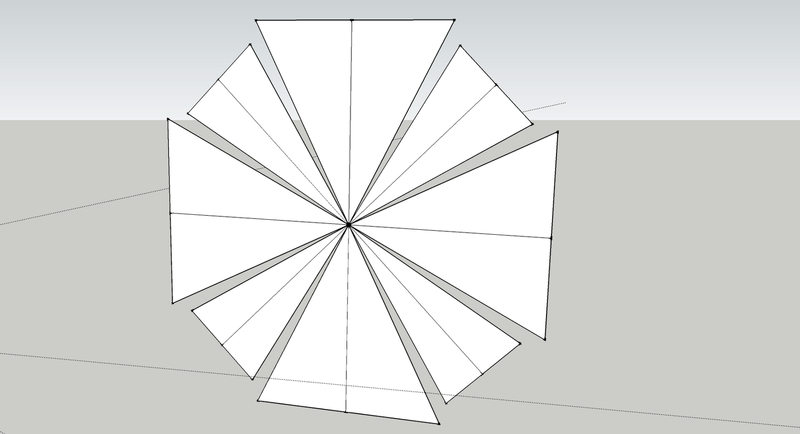 I've designed a variation called an OctaYurt because it has 8 sides. In addition to being substantially larger than a Hexayurt, it has a steeper initial roof pitch, allowing more headroom throughout. Here is a link to a google sketchup model. Using 8'x4' boards, an octayurt is 309 square feet. The core physics principles behind both hexayurts and octayurts is that the roof stays up as long as it has something pushing it in, and the connected outer ring provides that stability. The roof is resistant to too much force pushing it in because it reciprocates against the roof pieces next to it. The easiest way to understand an octayurt is from the roof down. The roof is made with 8 isosceles triangles.4 are made by cutting an 8x4 along its long diagonal, and the other 4 are made by cutting an 8x2 along its diagonal. Here is what the roof looks like flat. There are 3 levels to an octayurt. The 2nd level is made up of 4 8x4s attached to the large roof triangles, and 3 trapezoids attached to the smaller triangles. The trapezoids are made by cutting away a 4x2 triangle from each side of an 8x4, such that the trapezoid has a top side that is 4 wide, bottom side 8 wide, and height of 4. The reason there are 3 trapezoids instead of 4, is that one of the short sides of the roof is used for a door. Each section of the middle level is angled at 45*, and this causes the trapeze and rectangles to flush and reciprocate. On the door side, 2 middle level rectangles rest against shaped walls that act as a brace support. The 3rd and last level is simply 7 8x4s stood vertically on their long sides on every side of the octagon except for the door side. 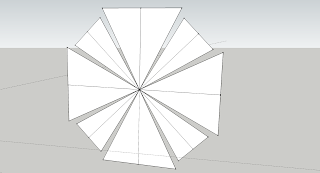 The 6 2x4 triangles cut out to make trapezes, can be used to make an awning for the doorway. Unlike the hexayurt, the octayurt does not have perfect math with these standard building materials. You can notice, on the south west corner, that there is an 8" "window" at the base of the top roof. This needs to be braced somehow. An approximate 27* angle will allow the top roof to be flush against each adjacent triangle, but a steeper angle for the large triangles allowing for narrow triangles to float on top a bit, and rest atop an extra strip of wood at its base that also spans between two large triangles in the roof. Another support strategy may be to use a steeper roof and have each adjacent triangle support the next, and ultimately supported by the door braces. The Octiyurt is likely to require the same bracing techniques as the plywood hexayurt, and is too big to be practical as a festival tent replacement anyway. Uses include homeless and emergency shelters, but also retail kiosks, school and office space, and cabins in areas that allow temporary buildings without a building permit. The plywood hexayurt techniques still allow the building to be fairly easily dismantled by unscrewing braces. 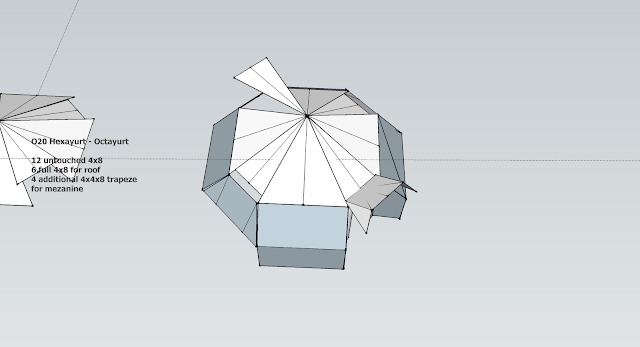 If you have built a hexayurt before, you can reuse almost all of the parts for an octayurt. By raising eligibility of OAS and GIS to 67 (equivalent to US social security), the Canadian Government took $30,528 from the poorest (1278/month), and at least $13000 (540.12/month) from all Canadians (who will live in Canada for 20+ years before retirement) . They may take even more from you by raising the eligibility age again before you reach 67, or canceling the benefits altogether. While lucky and successful working people would still be subsidizing those who are less fortunate, by paying more than they receive, they would at least be paying for a safety net they not just merely eligible to receive, but actively receive it each month themselves. For young people, they could use the money for university or booze or help pump up the economy in other ways. They're all free to work as much as they want ontop of the OAS funds, and not trapped into staying poor or unemployed in order to keep qualifying for handouts. National pensions and old age security have some philosophical and economic justification. The retirement social contract justifies that most of the taxes you pay in your youth will be returned to you at retirement in the form of pensions and healthcare. The human nature and economic presumptions of old age benefits compared to basic income is that it forces the young to enslave themselves until retirement, and so serves corporate masters with a larger supply of slaves. There is also a principle of reward and compassion provided to those who likely spent their life contributing to society. The retirement social contract is a bit of an illusion and pyramid scheme because today's taxes are used to pay for today's retirees. It is only reasonably fair if the benefits are guaranteed for every current generation. If today's baby boomers and seniors benefited from generous social programs in their youth, deficit financed useless wars (fought by the young), deficit financed prescription drug entitlements, and calamitous sea level rise scheduled 50 years from now, and then keeping retirement benefits only for themselves, while gutting programs benefiting younger generations, is pure evil theft by conservative politicians and conservative-voting age brackets. Guaranteeing the retirement pyramid scheme for all current generations by taxing enough to create budget surpluses, or eliminating useless and corrupt programs is the only moral option to providing basic income (or OAS to 18+ year olds). If basic income turns out to be unsustainable, then civilization collapses for everyone at the same time, having received equal benefits... having extracted an equal amount of flesh from the carcass. More importantly, it creates an equal say in preventing social collapse. Timing the collapse of society for just after the full and long life of baby boomers is so digusting that it justifies expelling conservative politicians and their supporters from our nations... treating them like thieves. This abuse is as discriminatory as giving benefits only to the majority race or gender. If we are going to intentionally allow the destruction of civilization, the only moral choice, is to schedule it to happen 90 years from now. Alternatively, if retirement or other entitlements have just been discovered to be unsustainable, replace them with basic income that are scheduled to run out in 30-50 years, so that the costs and benefits of that unsustainability are spread out among all generations. Another alternative is that if only those over 54 are eligible for some current and future benefits, then those over 54 should pay higher tax rates. Democracy for politicians means cobbling together a coalition of interests into a majority. This often involves packaging individually corrupt programs and promises to enough interest groups such that the coalition defends each other's corrupt gains. In the US the traditional Republican coalition in the last 10-30 years has been the unholy triumvirate of religious conservatives, large corporations and those influenced by small government demagoguery. The Democratic party coalition has included unions, and education, but mostly anti-unholy alliance proponents. Seniors and over-50 baby boomers are an interest group in of themselves, have remarkably homogeneous interests, and will only get larger and more important over the next 40 years. Older people have more wealth on average than younger people (due principally to the time available to acquire it). Older people vote more than younger people, and they have the wealth to directly influence elections as well. Global population forecasts estimate 9B people in 2050 and a peak of 10B in 2100. The increase from our current 7B is expected to come entirely from undeveloped nations. We can imagine that food shortages and competition for food explain these peak population forecasts. These images can turn horrifying the more we contemplate them. The crisis of democracy is the silent conspiracy of older citizens who can individually vote their self-interest in keeping the entitlements granted by previous generations, while voting against the other social contract components. Secondary aspects of the social contract include welfare and economic stimulus. Does an older citizen want more education spending? No. Welfare? No. Job Creation? No. Protecting Unions? will just increase consumer costs. Just lower taxes on their investments and keep medical and pension entitlements. If we lower taxes on corporations there could still be enough revenue available to pay their entitlements, and (short sightedly) it might lead to a value increase in their investment portfolios. The crisis of democracy is that other people's grandchildren paying for your lifetime benefits sounds like the best idea ever to the self, and the collapse of civilization after your lifetime, an inconsequential cost. At the root of this, is the concept of whether a society/nation carries in its heart the mandate to grow/sustain the society/nation. Portraying a pretense for this mandate makes politicians and people seem nice, moral and sincerely caring about the society. The belief is propagandized and instilled in children. Social growth and sustainability is in the interest of children and working aged people (especially if family focused). Its also in the humanist/divine's interest/goals to have social growth and sustainability. However, democracy is a mere collection of self interests and has no axiomatic principles. If a majority wants prisons for blacks and jobs and opportunities for whites, it can vote to promote such policies while patting itself on the back for eliminating slavery and creating civil rights. An autocratic king is more committed to social growth and sustainability than a democracy, because the king hopes to bequest rule over the society to an heir, while a democracy does not have tangible concerns beyond the individual lifespan of its members. While I am finger pointing older citizens for their self-interest to cash out of a society rather than contribute to its sustainability, they are not alone in that self interest, and this phenomenon happens frequently in the corporate world. Corporate management will always propagandize and sell commitment to future growth and sustainability of the organization. A board of directors is similar to a congress or parliament in that they have official power over organizational management, but are frequently hand picked by management, and influenced by the same people and factors. Both management and the board are insiders of a corporation capable of inflating the perceived value of the firm (justifying bonuses, salaries and benefits), while knowing when to sell (cash out) before the rest of the shareholders will hear and understand the news. Shareholders have the same pretenses of democratic decision inputs that our state democracies do, but are at a significant information disadvantage, and tend to vote for who they are told to. The corporate analogy to older democratic citizens is the block of shareholders enabling management and the board to eventually bankrupt the company. (The eventual fate of all corporations is bankruptcy). While there is a much weaker religious dogma for the sustainability of a corporation than of a nation, it is useful to management for the employees and stakeholders to believe in the sustainability mandate. I'll first mention a violent, unpleasant and undesirable solution: Soylent Green. Violent war between the young and the old. The young can win a violence contest with the old, even though the old can win a property/wealth based contest. Moral examination of this involves understanding the right of property, even if productive and valuable for social growth, as a right only deserving respect if it is accompanied with social justice/fairness. The current common accusations of class warfare every time a banker is criticized is fundamentally an attempt to escape the burden of social justice for property owners. One side can't morally justify the allowable tools of war if limiting the tools allows their side win. A more moderate version of this proposal is to simply cancel the pension and healthcare entitlements to the elderly. This is still violent theft of the contributions they made to the social contract. Entitlements they counted on. Part 1: There is 2 parts to the solution I recommend. They both involve the basic income aspect of natural governance. The first part could be skipped, and may at first sound as ridiculous as the violent solution above. If our nation is a sinking ship, and the upper floor champagne and caviar entitlements will run out before most of us can complete our 45 year term in the engine room bailing out water, then the fairest solution is to open up the champagne and caviar access to everyone, even if that both causes the benefits to run out more quickly and distracts some people from bailing out the water. Basic income is providing the same old age social pensions to citizens of all ages (or just to adult citizens) without any means (poverty) test. I've already justified basic income as a social right to a dividend, as an economic growth program, as a comparative cost to an expensive and inefficient bureaucratic empire that filters welfare recipients, and with a social peace and social justice benefit that forgoes the abuse and expense of militaristic justice and prison system. This new justification is based on the proper reaction to the consensus that the social contract ship is sinking. It is unfair to limit the benefits of the social contract to a select few who are electorally motivated to sink the ship as long as it carries the full weight of their benefits. The other unfairness is that of one (age) class insisting that the lower classes in the pyramid work to maintain benefits for those at the top which they are at high risk to never be able to obtain themselves. Entitling everyone to the same benefits, importantly, provides an incentive to keep bailing water longer if the consequences of stopping means an end to current benefits. It is a clear tangible loss rather than future retirement benefits that may have been cancelled anyways for any number of reasons. Its reasonable that shared benefit in society leads to shared commitment to its sustainability. Part 2: Although I disagree that basic income creates a net spending drain on a society, that fear is the only justifiable opposition to basic income (though the most common opposition is that all welfare and all taxes are evil). If granting all citizens basic income leads to overwhelming unsustainable debt that forces a default slightly sooner than the otherwise expected default, the solution then is to simply default and start a new society under a new name. I argue that a natural governance society would be the proper replacement of a sovereign, but let's discuss the alternative of USA 2. First, Sovereignties are artificial entities. The term sovereignty is still relevant today, even though there are few remaining kingdoms, because Sovereigns issue bonds for the state. Unlike corporations which have machines, slaves, and Intellectual property which they can turn into cash by either making and selling widgets or selling the assets, and even some levels of government who can put up buildings as collateral for loans or bonds, Sovereign bonds are exclusively backed by the reasonably immoral power of the state to violently extort taxes and duties from people. All of the major revolutions (US, French, Russian) involved a repudiation of national/sovereign debt. Though, its not listed on the link, I recall the US arguing for the repudiation of Iraqi debt after they captured Saddam Hussein. Another major difference between Sovereign and corporate debt, is that there is no court with jurisdiction over Sovereign actions of any kind, and no power or jurisdiction to enforce any payment or restitution. The only recourse is war. In the case of declaring USA 2, and repudiating all debt, the question of who and whose army would/could do anything violent is probably a null set. In the case of Greece 2 or Iceland 2, though there are powers that could impose their will, it is my hopeful opinion, that shared democratic idealism would prevent military action. Sovereign bond lenders have likely miscalculated the possibility that a democratic government could be declared corrupt. Fundamentally, the declaration that USA 1 government is corrupt is the only propaganda declaration (odius debts) necessary to justify repudiating its debt for the new USA 2. I assume that the majority of Americans consider the US government currently corrupt, considering that the Ebola virus has the approximate same approval ratings. If a referendum to declare the US government odius/corrupt had the consequence that a yes answer means eliminating over $10T in financial obligations (and growing significantly each year), then many fence sitters would vote yes. The USA 2 concept is within the current political spectrum because elected officials can envision retaining power, while repudiating debt. There is an alternative retaliatory option than war available to creditors. The threat to never lend any more. If the US government just declares itself evil, repudiates its debt, but stays in power without good revolutionary theater, then USA 2 will not attract new foreign investors. An explanation for the delay in the declaration of Greece 2 (default on its debt) is that the timing for Greece 2 is dependent on foreign creditors refusing to lend it any more. If foreign creditors haven't yet refused to lend Greece more money, then there is no reason for Greece to default right now. When creditors do refuse to lend it additional funds, Greece will have no reason (other than fear of war) to not repudiate/default on its debt. I expect a crisis in all sovereign debt after Greece repudiates its debt, because they will show how easy it is... Better lend Greece more money. The reasons that a natural governance society is better than a simple rebranding of the sovereign are many. First, relevant to these discussions, is that natural governance's basis as an association of people means that it can claim a message of being less corrupt than the state it replaces, and so can claim with a straight face that it deserves to repudiate its former state's debt. The undeniable impression of revolutionary social justice in Egypt's 2011 Arab spring, limited the US's aid to its puppet regime to supplying it more tear gas. Second, an association of people can form a real basis for borrowing money that a sovereign lacks. The association of people can be jointly liable for the loan. So at the very least, foreign creditors may overlook new and innovative ways they could fail to be repaid. Third, and most important, natural governance has no basis for long term debt. Each social function and program is proposed, created and continued with a funded budget. There cannot be an unfunded program. Furthermore, tax collections should be targeting the overfunding of total program costs, because natural governance targets surpluses to distribute as egalitarian dividends. Fourth, if there is an accidental or short term deficit incurred, it is to every society member's interest to repay it as quickly as possible so as to resume receiving cash dividends. To summarize the argument for natural governance over the rebranding of a nation: It allows the credible repudiation of debt on previous corruption grounds, provides for the shared liability of the people in incurring new debt, doesn't require or use any debt in governance, and its members are deeply motivated to repay debt quickly if it is incurred. Another basis for natural governance is that even if it promotes a target level of survival basic income as a fixed entitlement, its designed around distributing surplus revenue as a citizen dividend. If the burden of those not creating taxable income ever becomes too high, relative to the dividend amounts, then the dividends/entitlements can (and should) be adjusted down. The difference between fixed entitlements that society is obligated to pay you, and shared surpluses dependent and proportional to you and your neighbours' (and thier children's) efforts, is that the latter encourages nurturing society. Even if nurturing society is against the collective financial interests of many individuals, nurturing society will still make them happier and less shameful. Libertarian and anarcho-capitalist philosophies generally espouse the voluntaryism principle that society would be better off if its members formed bilateral contracts among each other as an alternative to socialized decisions or policy. The simplest bilateral contract forms a customer-supplier relationship. The clear advantage of independent customer relationships is the right of the customer to divorce his supplier and seek another alternative. The evils of a customer relationship, however, are that customer information knowledge is not perfect, and the supplier sales function involves educating/brainwashing its clients that their offering is to the customer's benefit, and the supplier is interested in seeing all other alternatives destroyed. Our current Citizen-Government relationship very much represents these worst evils of customer relationships. Even if our democracies allow us a small role (1/300M) in participating in the selection of our supreme ruler, and grant us some rights of due process and speech, we are still in a position of being brainwashed/educated that invading Iraq, drug prohibition, and family law are good for us. Our rulers furthermore entitle themselves to a monopoly of rule, and alternatives are effectively prohibited. In the battle of ideas, it is understandably difficult for people to forecast the preferred social organization because (with the libertarian path) the theoretical possibility of choosing service providers and leaving them for "better" service providers, involves giving up the protections of due process, and the enforcement against the most egregious forms of extortion and anti-competitive violence. It would be a necessarily worst outcome if a completely free market, results in the freedom to corrupt markets, and monopolies that are less accountable and "fair" than our current governments' ensure. Shareholder-Corporate relationships are also usually customer-like relationships. Shareholders of public companies do have the power to leave easily (by selling their shares at minimal transaction costs). But because public corporations tend to have a large management-loyal shareholder group/majority, management can educate/brainwash its shareholders that it, and its actions, are good for them. Because those who are both not loyal to management and unhappy with direction will self-select themselves to leave, rather than influence management, in public companies, shareholders can be classified as either management loyal or management apathetic. A minority shareholder is just as powerless as affecting the corporation, as a citizen is powerless in affecting his government. Only monumental organization effort can hope to effect change, and even then, failure is more likely than not. The primary abuse of shareholders is to pay them insufficient dividends, and instead keep the surpluses to spend at management's discretion, usually, until the business is eventually bankrupted. One example of management's abuse of shareholders is Intel's purchase of McAffee for an overinflated amount. While shareholders had the freedom to leave upon hearing the news, their option to do so came at a cost of $4B in lowered stock price. A membership relationship is one where members have both influence over the organization and deserve and obtain their share of operational surpluses. Ultimate membership relationships involve equality in ownership amongst members, and a decentralized organizational structure where no single administrator oversees all organizational decisions, and member initiatives are approved and led independently. The principles of ultimate memberships are the basis of natural governance, natural-finance-communal-equity, and open partnerships. The simplest rule of thumb to determine whether a relationship is customer-like or member-like is whether the administrators have the power to set their own salary, then explain how that is good for you. The primary benefit of a membership structure is that it solves the monopoly problem. If customers have influence over the pricing and service level of their membership services then if they are overcharged, they at least benefit from the organization's profits through dividend payments of the surplus. So the harm of monopoly on its customers is neutralized. If alternate suppliers would be to the benefit of customer members, then customer members would not authorize the destruction of competition. If the membership organization is decentralized then would-be-competitors can join instead, and propose a member initiative for an alternative/supplementary service. Car sharing services are a recent innovation leveraging the appeal of sharing culture, and modern communications infrastructure. There are 2 distinct business models: One where a fleet of company owned vehicles is made available for sharing, and the other where individual suppliers offer their car for sharing when they do not need to use it. Both models offer attractive new customer propositions compared to both traditional car ownership and car rental models. Even if they are forced by market alternatives to offer attractive customer proposals, car sharing services, even if highly democratizing the customer experience could benefit from real membership models. For instance, the real value of the organization in the business model where consumers (renters) and producers (car sharers) are matched is the marketing and matching software and processes. A membership driven organization can use its members for financing. That is consumers and producers can buy a share of the organization and/or lend funds to the organization. Spreading risk among members allows the organization to charge its members less, and still be sustainable (or charge more and pay surpluses back to members), and so can outcompete alternative capital structures and business models. Therefore, not only can membership organizations prevent the harm of monopoly on its customers, it can also provide the most efficient organizational structure possible. An explanation for the basics of communal equity and membership organizations (at link). A question I cannot yet answer is whether it is possible to have partial (rather than ultimate) membership features. Membership at its core means influence and financial participation. While a corporate or governmental PR department would appreciate creating an illusion of influence (white house petitions) or illusions of financial participation (theoretical possibility of corporate dividends), its unclear how limited influence in decisions or dividend policy can properly constitute influence rather than powerlessness. Under libertarian philosophies, it is unclear how extortionist mafias don't become an overwhelmingly powerful protection force. If you can't stop them, it is at least better for you to be a mafia member than an extorted mafia customer. Deficit Adjusted GDP - An improvement to measuring economic health. This is essentially a basic-intermediate economics post that hopes to fix distorted public policy discussions. Gross Domestic Product (GDP) is the sum of all income during a year/quarter in a nation. It is used as an economic benchmark for the health of nations. So it becomes a politicized tool of economic policy management: Calling on government to create economic activity and jobs. The single most important simple fix to economic distortion and mismanagement would be to use a new benchmark: Deficit Adjusted GDP (DAGDP). This benchmark simply substracts from GDP, social (governments for every level) annual growth in public debt. The key reason for this benchmark is that any $10T(rillion) economy (as measured by GDP) can become an $11T economy by incurring a $1T deficit/public debt increase. To remain at $11T, the economy must maintain that $1T deficit/public debt increase each year. Deficit increases can be effective (or inneffective) in growing the economy by more than the deficit amount through what is known as the multiplier effect. This is dependent on the kind of deficit, the tax rate, the proportion of deficit funding that is saved, and the proportion that remains within the society. A $1T tax cut given to the wealthiest who will not spend any of it will not increase GDP at all. A $1T spending increase that will be entirely spent within the society on taxable activity, whose recipients in turn spend it all on taxable activity within the society will not only increase GDP far more than $1T (through the respending), but will increase tax revenue by the full $1T (through infinite respending that creates more economic activity that is eventually taxed as someone's profits). Comment on above US chart and table: From 2002, US debt increase has been above 500B/year, and grown dramatically to over 1T/year since 2008. DAGDP for 2009 (12,117B) was below DAGDP for 2006 (12,733B). This doesn't mean that 2008/09 stimulus programs were a poor reaction (or smart), but rather that there would have been substantial more economic collapse without them. The econometric labelling of a depression is a 10% reduction in GDP. That was practically achieved in 2008 in DAGDP terms. Political economics can avoid every depression or recession label by simply sufficient skyrocketing deficit increases. The practical future policy basis for DAGDP in dealing with current unsustainable budget deficits is to achieve stable to slight (0%-2%) GDP growth while targeting smart deficit reduction initiatives. DAGDP growth of 4%-6% can be targetted and achieved even while traditional economic measures show relative stagnation. Without DAGDP as a benchmark policy tool, it is too easy for politicians to keep increasing unsustainable deficits (or download to state governments) in order to keep apparent (GDP) economic measures, and short term electability prospects. Another general argument against even broad tax reductions is that it tends to not affect the "beer money" component of average disposable income much. Average citizen tax reductions mean that they can afford more for gas/food/rent/healthcare, and this causes price inflation in those sectors which capture most of the disposable income increase that is created by the tax reductions, and so very little true (job creating) economic activity is created by tax reductions. A focus on disposable income, and especially the truly discretionary part of disposable income, is the key to sustainable economic growth. Just as important is the reduction of the necessity of saving through lower healthcare costs (ideally socialized) and the existence of social safety nets. A purely market approach to healthcare could allow individuals to think that they can buy infinite life, but they need to save millions to cling to that hope. Socialized healthcare even if some end of life treatments are deemed socially unaffordable, are highly economically stimulative because they allow individuals to consume instead of saving throughout their life. If you eliminate social safety nets such as healthcare and old age pensions, then you reduce disposable income more than through equivalent progressive taxes because every individual is forced to save/insure for future expenses, and the flat/regressive nature of the forced savings significantly reduces the proportion of society able to afford homes, vehicles, and other consumer goods. While natural governance focuses on the only truly fair entitlement of basic income (citizen dividend-as-equal-share of social tax income), there can be obvious other entitlements (healthcare) that are a net benefit to society's welfare and economic health/growth. Even with our relatively corrupt current governance models, benchmarking economic performance through DAGDP instead of GDP would ensure that sensible policies are discussed, and underline the destructiveness of war spending, and crony giveaways to the wealthiest. In the US specifically, the Congressional Budget Office (CBO - relatively independent analyst of policy proposals) should adopt DAGDP to score policy. A More comprehensive alternative to using GDP as an economic benchmark was initially discussed. That different approach focuses on aggregate social wealth.